What if you could unbox a story? Wonder and Company invites you to dream again. What if you ran away with the circus? What if you discovered an underground labyrinth? What if you inherited a tourist trap? What if magic is real? Story Boxes that ask "What if...?" 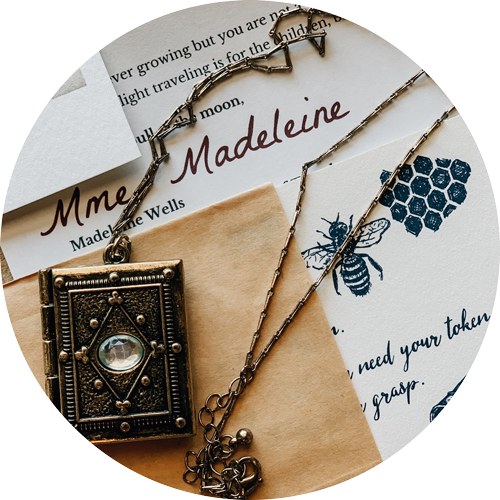 Spellbinding ephemera draws you into the story. Beautiful wonders and wares for home, office, and bath bring worlds to life. Perfect for the creative spirit, fantastical book lover, and dreamer. First a teaser, igniting curiosity, followed later by your Story Box. Story Box plans start at less than $48 once a quarter. NEW Mini Story Box plans start at less than $22 once a quarter! What if... you allowed yourself to escape into the fantastic? These are the Wonderful Objects to transport you. Create your account. Make changes anytime (cancel, skip, swap, etc). You're in control! You have the option for your gift to renew or not. Make your choice at checkout and let the wonder begin! Our Story boxes are delivered simultaneously once a quarter (once every 3 months) with unexpected surprises arriving unannounced weeks ahead of your box. 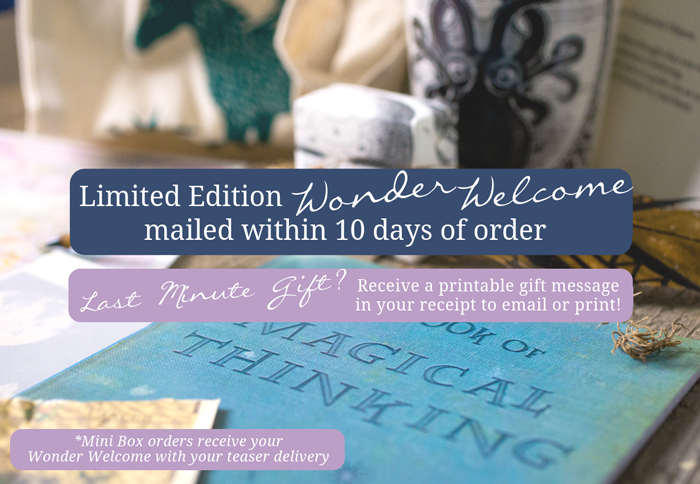 Story Box subscribers receive a Wonder Welcome within 10 days with intro card, 5x7 print, and more... followed by their teaser delivery. Mini Box subscribers receive your Wonder Welcome with your teaser delivery. Full Story Box plans as low as $48 a quarter. That's less than $16 a month with our most popular plan of 4 quarter prepay! 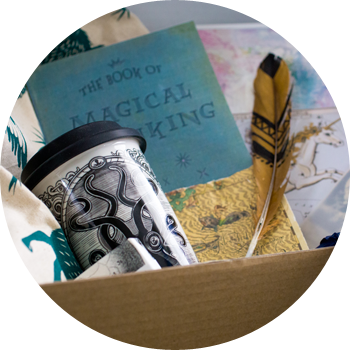 Created to encourage imagination, each Story Box is designed for you to relish the unboxing experience. 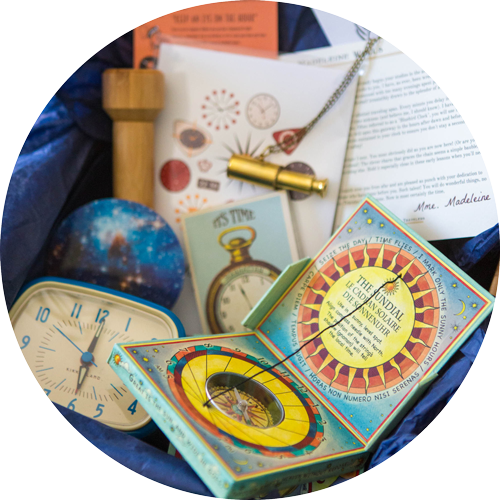 Use the Wonderful Objects enclosed as reminders to take time to dream and embrace adventure. Made with quality storytelling in mind. The contents are a mysterious surprise but there are no mysteries to solve. No right or wrong answers. This is your sacred moment of permission to escape into the wonderful. Each quarter sells out quickly so reserve your spot! When will your first delivery arrive? Winter/Spring Orders are now open! Wonder Welcome deliveries are shipping now to full Story Box subscribers. Teasers mail by late March. All boxes anticipated to ship late April. Mini Story Box subscribers receive your Wonder Welcome with your teaser delivery. Last chance for our best discount! Discounted annual plans are going away soon! We're preparing to move to a new storefront and discontinuing our pre-paid annual plans. Our Winter/Spring quarter officially opened in February. All Pre-Orders placed before February: the clock has officially started on this quarter and the magic has begun! Desperate for a past box? Join our newsletter for possible reissues! Reissued boxes will be made available to current subscribers first. "I bought this for date nights with my wife. Have questions? Wonder what to expect? Check out our FAQ page! Domestic shipping is $6 - $9 for the entire quarter (that's multiple deliveries!). Makers welcome! Contact us to see your product featured in Wonderful Objects. Weeks before our Story Boxes arrive, subscribers receive an unannounced delivery: Our teasers have quickly become customers' favorite highlights of the Wonderful Objects experience. Subscribers report driving themselves to distraction imagining where their ephemera has come from, if they themselves sent it home from a past adventure, or if it's perhaps from characters we've yet to meet. We don't promise answers but we do promise the inspiration to create them on your own. What you imagine may surprise you. Wonder abounds. 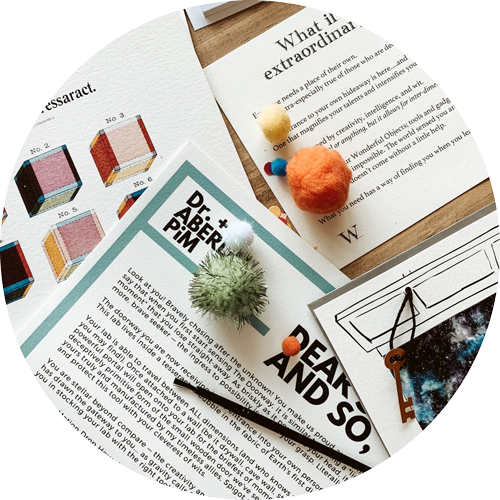 Much of Wonderful Objects is custom designed for you and/or handcrafted by small business artisans. Our LIMITED EDITIONS sell out quickly so subscribe today before the next teaser ships! Once the mysteries of the current quarter begin to be revealed, the new quarter's ordering window begins. Unlike any other subscription box. We encourage subscribers to give us 5-10 minutes of their time when their deliveries arrive and we'll give you hours of enjoyment. Really notice the details. Suspend your disbelief and pretend that your delivery really has arrived from a magical place. Let it inspire your everyday moments. Our hints of stories imbue magic into the objects, if you let them, and unleash something you didn't know you were missing. Look with wonder at the world around you and rediscover the power of asking "What if...?" Join us today and rediscover your wonder.